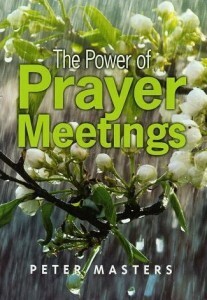 The last few Wednesday evenings in our CRBC midweek meeting I have been reading some excerpts from Peter Master’s booklet “The Power of Prayer Meetings” (Sword and Trowel, 1995, 2011) before our corporate prayer time. 1. We should pray with great feeling and earnestness. 2. We should use direct and plain language. Our language should be straightforward and not a grand, florid production. On a practical level, in large corporate gatherings it might be good to stand while praying in order to be well heard. 3. There should be many contributors in the church prayer meeting. Masters encourages as many as possible to pray audibly in the prayer meeting. If the average spoken prayer is about three minutes, then in a 40 minute prayer meeting about 12-15 people might voice public prayers. This means participants should avoid overly long prayers in order to give others the opportunity to pray. Prayers for more “pastoral” concerns should be given by more mature members. Participants are encouraged to come prepared to pray and to be bold in prayer, helping the prayer season to be continuous, without long gaps of silence. 4. Public prayer should be addressed to the Father. Masters teaches that corporate prayer should be addressed to God the Father. This is the example of Jesus in the “pattern prayer” (the Lord’s prayer in Matthew 6:9). He also encourages public prayers to end with “in the name of Jesus Christ, our Savior” or some variation on this. Finally, Masters encourages all participants in the prayer meeting to join with the one praying in saying “Amen” at the close of each public prayer. Again, Jesus closed the “pattern prayer” with “Amen” (Matthew 6:13; cf. 1 Chronicles 16:36; Nehemiah 5:13; 8:6; 1 Corinthians 14:16). Let us have the same spirit as the first disciples when they asked Jesus, “Lord, teach us to prayer” (Luke 11:1).